If your kids do a lot of crafts, they probably need a space of their own to store all of their supplies. When craft supplies are well organized, then it is a breeze to check your inventory and begin a project at any time. I love the idea of a cart with drawers. This is something that can be rolled into any space, including mom's craft room, and pulled out to wherever the kids want to work. 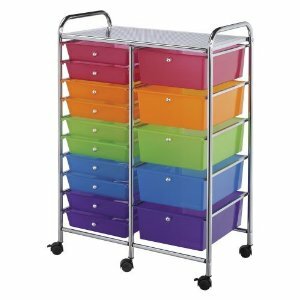 I found a great looking cart with smaller drawers on one side and larger drawers on the other for bulkier items. These drawers are great for storing work in process projects as well! The colorful drawers are kid friendly and still stylish enough for mom's craft room.